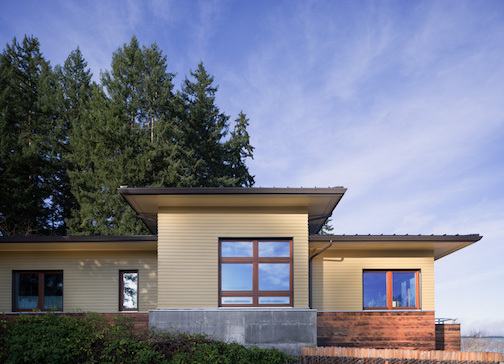 Influenced by the Prairie School of architecture and designed to the rigorous standards of Passive House, this waterfront home in Olympia, Wash., provides an extremely energy-efficient design that will allow its owners to age in place. Tessa Smith, co-owner of The Artisans Group, an Olympia-based design/build firm, walks DI through the project. DI: Please give us a brief description of the clients and what they wanted out of their new home. TESSA SMITH: They’re empty nesters — not quite retired, but this is going to be their final home, so to speak. They wanted it to be designed so that they could be independent as long as possible. As far as architecture, they wanted a kind of hybrid style, a little more traditional than some of the homes we do but still clean and modern. How large is the home? It’s 1,850 square feet and has two bedrooms and two baths, with a bonus space in the basement. There’s an office adjacent to the kitchen, and the laundry room and mechanical room are on the main level. 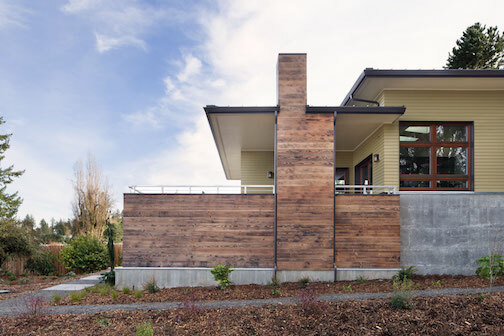 Was it the clients’ idea to build a Passive House? We’ve done 18 Passive Houses to date, with more under construction. The clients visited many of those houses before they hired us. What kind of design challenges did the site present? The site is in a well-established, close-knit neighborhood near a public marina. We wanted to be as respectful as possible and make the house look as if it’s always been there. That was made trickier by the fact that the lot was very narrow and long (45 by 130 feet), and the narrow end faced the water. So figuring out how to articulate the building in such a way as to get views from every room was really challenging from a design standpoint. Our solution was to place windows carefully and add a screened outdoor entertaining area with a gas fireplace to capture views to the northwest, but provide privacy and a place of refuge. A terrace door leads seamlessly to this outdoor area from the living and dining areas. The home gets plenty of natural light from the tilt-and-turn and fixed windows in those areas. There isn’t any southern exposure to speak of, so the house is heated by the eastern exposure. As far as the floor plan, did the clients point you in specific directions? Some of their needs changed along the way, and the house ended up with a basement apartment that has a bedroom, a full bath, a kitchenette, a living room, and a separate entrance. They wanted to be able to accommodate adult children or a caregiver in the future. 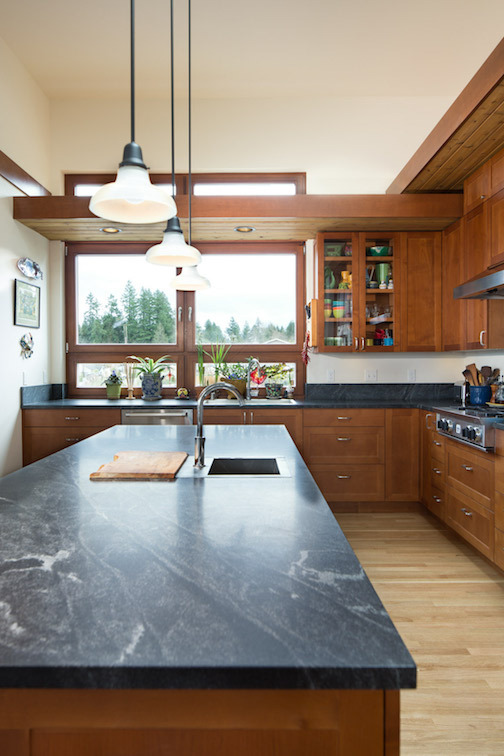 What are some of the most noteworthy products and materials you used to meet Passive House requirements? The home relies on extremely high levels of insulation, airtight detailing and construction, and the implementation of high-performance, custom-made European windows and doors by Zola. 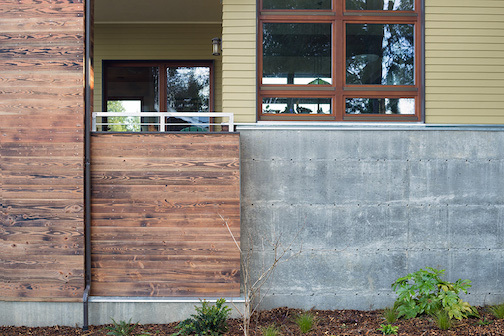 Windows and doors are the trickiest items to source for Passive House, by far. Many that meet Passive House specs are very expensive, and the American versions are often not very well made, to be blunt. Zola makes amazing products that completely lend themselves to the kind of airtightness we’re going for. We selected the Thermo Wood line, which boasts R-11 triple glazing and is thermally broken with a layer of patented German Purenit (a polyurethane product on a rigid foam base that provides high thermal insulating value). We’re also using a Zehnder heat-recovery ventilator (HRV), a really great unit that’s whisper-silent when it’s running. It continually brings in fresh, filtered air and exhausts stale, used air. So in our heating-dominant climate, you get to have fresh air and keep the heat inside the house. 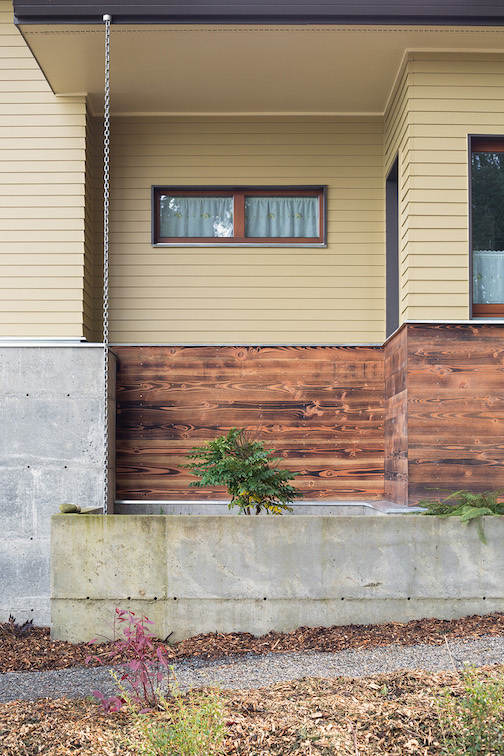 Per Passive House requirements, the home has low-flow fixtures and low-VOC paints and finishes. We used a local cabinet company, Beech Tree Woodworks. The cabinets were made less than 20 miles from the house, which is pretty cool. Did you use any reclaimed materials? Not many, although there are some interesting finishes. 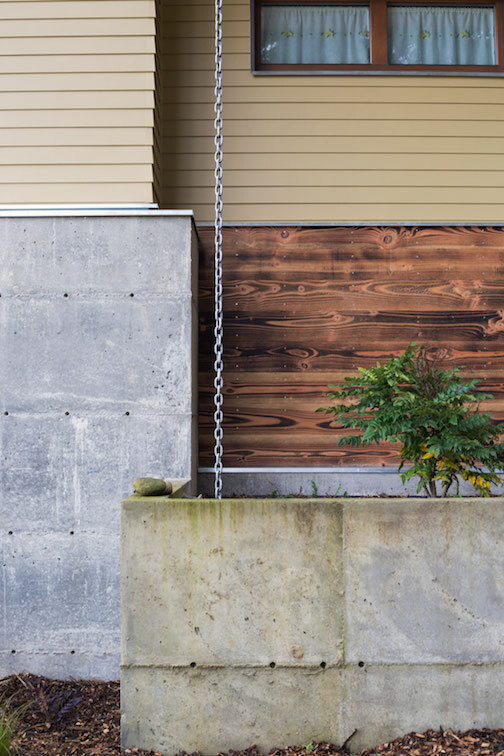 The exterior siding was treated with Shou Sugi Ban, a traditional Japanese technique of charring wood to preserve it. 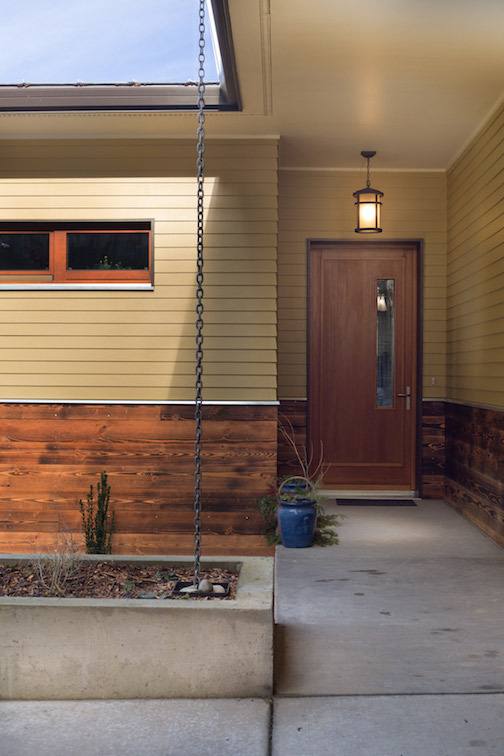 There’s also exposed concrete on the exterior, which is a good fit for the Prairie style and helps the house fit seamlessly into the neighborhood. The concrete planters are a nice way to organize landscaping, which is being professionally installed as we speak with native and drought-tolerant plants. Additional hardscaping is also being installed. What do you like most about the design? 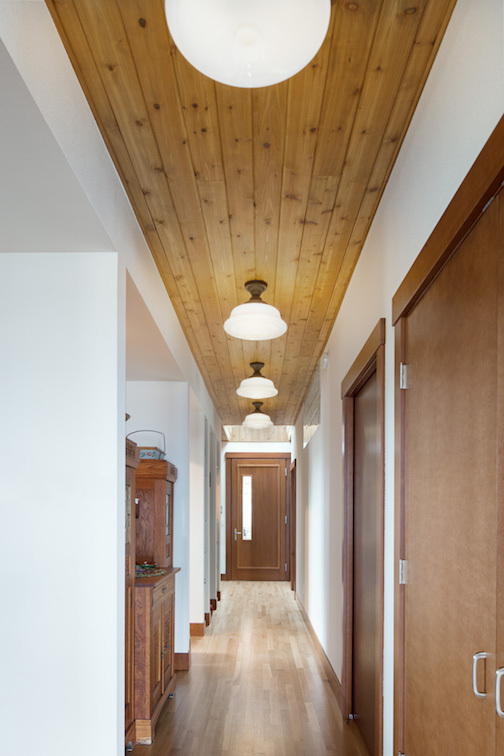 It’s true to the Prairie style, low to the ground with hipped roofs and broad, overhanging eaves. My favorite element, though, is the covered porch, which is cantilevered so it looks like it’s floating. It’s very tricky, with Passive Houses, to design cantilevers that don’t have thermal bridges, which would ruin the energy-saving components of the structure. 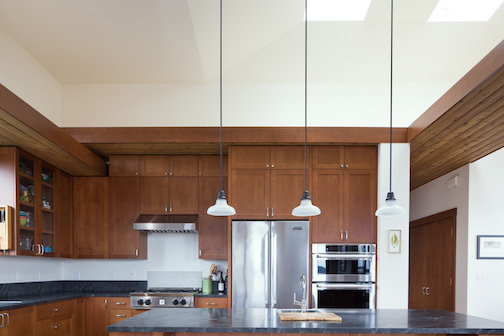 Do you have any advice for readers about designing and building Passive Houses? 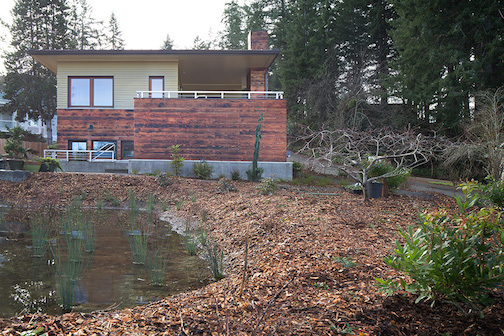 Don’t just take a design and decide you’re going to make it a Passive House. You should start out knowing that, rather than designing a bunch of expensive, tricky, impossible-to-follow details because you weren’t thinking ahead. If you go into a project knowing it will be a Passive House and design it well, it won’t be that much more expensive than a code-built house. The more that designers and builders realize this, the faster the Passive House movement will gain momentum.